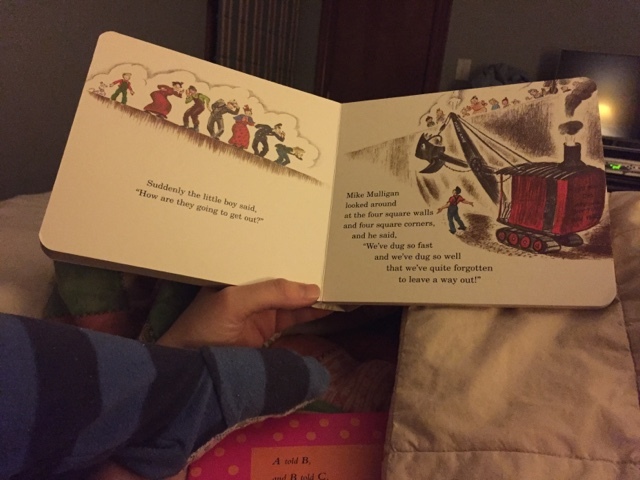 Don't get me wrong, I LOVE Mike Mulligan and His Steam Shovel. It is just a fun book. Mike is faithful to his companion even though she's old and outdated. It is a story of loyalty and hard work and solving problems and adapting to be productive members of society. Okay, seriously, it's kids book that little boys love because there's a big digger and a little boy and don't forget the fire dog. HOWEVER, every single time I read the book I cannot help but cringe at the critical point. "We've worked so fast and so well that we've quite forgotten a way out"
Well you know what? If you forgot your way out then you have worked too fast and not very well at all. Call me crazy for ruining an awesome kids story but Mike didn't do his job well at all. He wasn't thinking through what he was doing and because it was rushing to get done by sundown he cannot get Mary Anne out of the cellar. That's not GOOD work. Obviously the little boy saves the day with his excellent idea - don't get me wrong - and everything works out. I get it. I get it. Please tell me I'm not the only one who adores this story but gets a twinge of annoyance over this point.